Jet Cellular offers top deals at lower prices on all your cell phone needs.Order cellphones and devices from Jet Cellular. Free Delivery on Orders Over R350 if you buy online. Buy on your Thank U account and accumulate thank you points. 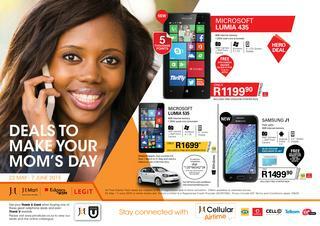 Order Cellular Deals with MTN, Vodacom and Cell C. View the Jet Cellular catalog and select your preferred deal. Jet Cellular Insurance is there to protect you if in case your cellphone lands in wrong hands. Apply now for a Jet Cellular Cellphone, Wheather you are looking for an iPhone 6 , iPhone 5 , Samsung Galaxy 6 or latest Tablet.